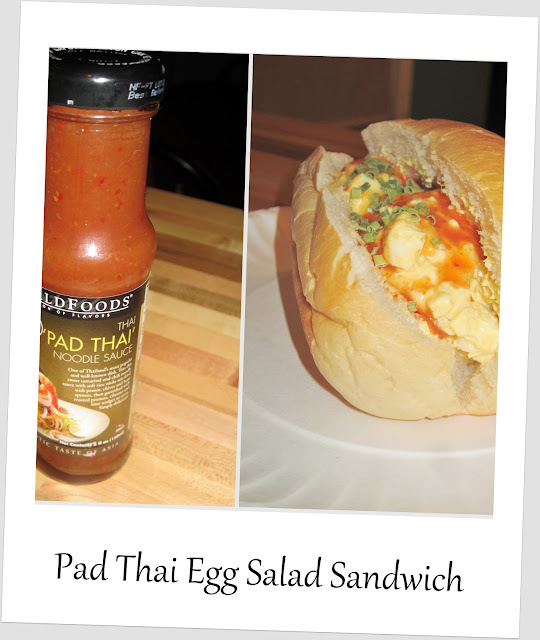 One of our family's favorite lunches has to be a good egg salad sandwich. I usually hard boil my eggs, cut them up into large chunks and then add in the rest of my ingredients to make a hearty and flavorful salad. We pile it high on our favorite bread and there are never any leftovers. It's definitely a filling comfort food. I decided to open up my bottle of WORLDFOODS Thai 'Pad Thai' Noodle Sauce for a little taste. This sauce has a light spice to it. It contains dried chili, garlic, tamarind, shallots and onion. All of these flavors pair perfectly with eggs. This sauce would also go amazingly with shrimp or any kind of noodle. Enjoy! This recipe has a light heat and delicious sweetness that the whole family will love!